Cities around the world celebrate Valentine’s Day—a day to cherish the binding love between two souls. In New York City, the scent of romance is eminent. In the days leading up to this celebration of love there are countless gift ideas, for the hopeless romantic to the practical. On one particular Valentine’s Day I found myself without anyone to spend it with. I had been dating someone for seven years, but desperately yearned for a break – emotionally and mentally. I’d been on my own for three weeks, and I was beginning to enjoy the concept of “me” time. Although it would have been nice to receive the usual box of candy and bouquet of roses, or even a surprise dinner at Nobu or Indochine, being alone became more appealing by the minute. My closest friends at the time were either married or in committed relationships, so making any kind of effort to drag them out on the town was completely selfish and out of the question. After all…Valentine’s Day is for lovers. Or so I thought. Another day at the office came to an end, but not without hearing the sound of utter giddiness echoing through the halls. As I approached the elevator bank two female co-workers were happily sharing their plans for the evening. “Larry’s taking me to a Broadway show tonight!” one woman said. “Brian has something planned. I can’t wait!” the other replied. When the elevator doors opened into the lobby a hoard of businessmen rushed towards a man selling roses by the dozen. A part of me wanted buy a bouquet for myself, possibly for validation that I too could be loved. But how could something like roses validate, or even justify love? I rolled my eyes and walked through the revolving doors into the street. The sun, hardly present in the city that day began to set and the temperature began to quickly drop into the 20’s; violent gusts of wind practically blew me off the sidewalk. My usual five-minute walk to Grand Central Station felt like a five-mile marathon. My favorite high heels were covered in slush from the previous day’s snowfall, and I couldn’t wait to be home to drown myself in further self-pity. While waiting for the subway I noticed an elderly woman on the platform, also selling roses. “Eight dollars a dozen,” she said to the passerby. I stared intently at her, wondering if wallowing away with a bottle of wine would hurt, rather than help. 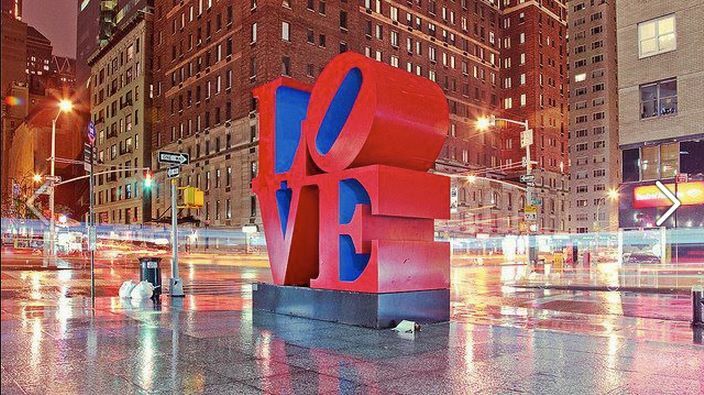 There are so many ways to celebrate love in New York. Why not celebrate it on my own? The train approached the station, as soon as the door opened I ran back upstairs to the street level. I hailed the nearest cab I could find. “Hi, 48th Street and 8th Avenue, please.” I muttered to the cab driver. I decided to have dinner at Pongsri, my favorite Thai restaurant in Midtown. I had made my first attempt at becoming vegetarian early that year, and their “Siam Rolls” and other vegetable dishes were to die for. What I initially thought to be a quiet dinner for one became a Valentine’s Day gone awry. The restaurant was beautifully decorated with heart-shaped balloons and red streamers hanging strategically above each table. The hostess greeted me with a warm smile as she took two menus from the counter. “Uh, no. Dinner for one,” I hissed. As I sat down she politely asked what I’d like to drink. “A glass of white zinfandel, please.” My heart began to race. What was I doing? I ordered my rolls and vegetarian dish and the server brought the glass of wine. My paranoia set in. What if someone saw me eating dinner alone on Valentine’s Day? Was it such a cliché that one must be in a relationship to be loved? I took my first sip and looked around the room. I immediately felt a calmness flow through me as my dinner was served. The food was impeccable as always, and when I asked the waiter for the check I looked at my watch. 7:30. I was finally ready to go home. All I could do was smile and utter a “Thank you,” before leaving the restaurant. I stood outside for a minute or two, beholding this lovely gift. The temperature seemed to warm up a bit, so instead of hailing another cab I took a long walk to the subway station. My mind brought me back to the earlier part of the day, when there was an overwhelming resentment of something—or someone. This woman’s simple act of kindness had washed it away. Suddenly, I realized…Love is indeed kind, if we are kind enough with ourselves. I was my own Valentine, and that was just fine by me. Lovely story! Thank you for joining us at the #HomeMattersParty. We hope to see you again next week! What a beautiful story! Thanks for sharing it with our readers at Inspire Me Mondays! Sometimes it is really nice to be your own date! Love your story. Thanks for sharing at the #HomeMattersParty – We hope to see you again next week.